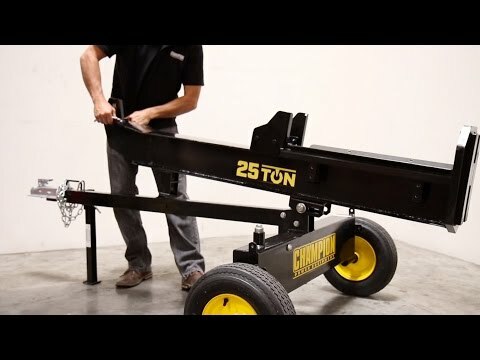 The Champion 25-Ton is a professional gas log splitter – expensive but offers an excellent power (check out the video below) and you can even convert it into vertical position if you prefer to use it that way. The Champion 25-ton splitter comes with the common pros and cons of gas powered machines – you can’t use it indoors, you have to deal with fuel, oil and hydraulic fluid and it’s also louder than electric tools. On the other hand you may use it even in the woods or take it to your cabin as you don’t need an electric outlet. The assembly is fairly easy (watch one of the videos above), just takes some time – about 1-1.5 hours according to the users. And keep in mind you also need to purchase the hydraulic fluid (5 gallons of it) and motor oil (10W30) separately. Considering the power, this splitter is a monster. The skewed wedge works nicely, it cuts standard logs like a butter (with cycle time under 12 seconds) and even knotty or twisted pieces are not a problem. And you can also convert it into a vertical position in a a few seconds. 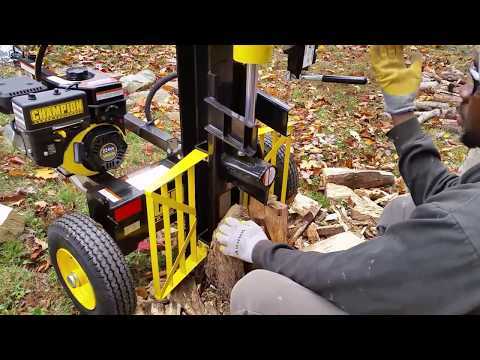 That is useful particularly for large, heavy logs – you just roll or push them under the wedge and split. The engine starts easily, mostly on the first pull. So if you need to split a lot of wood, this is the tool for you. This Champion splitter is equipped with a 2-inch ball hitch coupler with an extended tongue and it fits most ATV/UTV towing applications. And the large 16" tires enable towing even up to 45 mph speed. Unfortunately there are also two minor issues that users mentioned in the reviews. First, the log catchers are okay but a bit flimsy – one customer reported he had to make a new set after splitting about 10 cords of wood. The second problem is that the return hose is connected with a clamp only. And while it comes loose quite rarely, make sure to check it every few hours to prevent any loss of fluid. 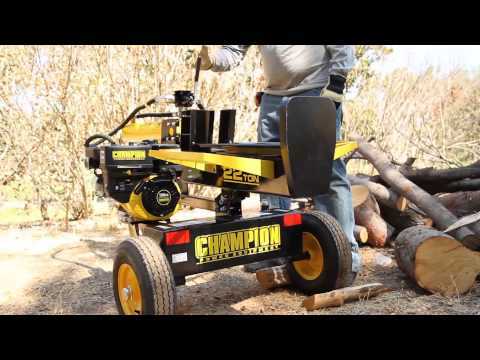 Conclusion: The Champion 25-Ton is our most recommended heavy-duty log splitter – if you split let’s say 6 or more cords of wood per year, you need this beast. It offers a great power, fast cycle time and you can even use it vertically if you prefer that. We can definitely recommend it to you. But it’s just too expensive for an occasional use – so if that’s what you need, check out our most recommended models here. 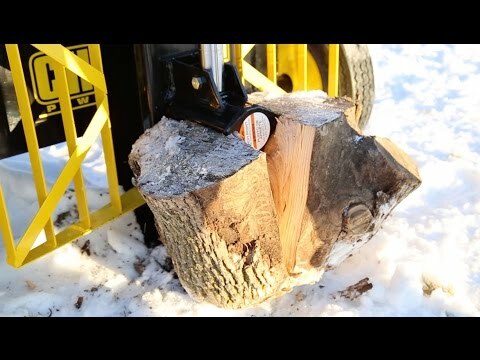 How large logs can it split? What about the hydraulic oil? The unit comes empty of all fluids so you need to purchase the hydraulic fluid (5 gallons) and motor oil (10W30 4-cycle oil) separately.